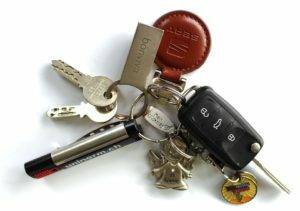 Transponder car keys offer substantial security against car theft. However, broken or lost keys could be challenging as transponder car keys replacement requires the skills of a seasoned and professional locksmith. While it is not a very complicated technique, but a locksmith must have the right tools and knowledge of latest key cutting machines and software. Racine’s Lock & Key provides expert and professional transponder car keys replacement services in Mount Pleasant and surrounding areas. So, what are transponder keys? Transponder has an advanced system that protects unauthorized access and hotwiring. The car manufacturers came up with the concept of these keys during 1998, and since than these keys are a part of every vehicle. What is so special about transponder car keys? The key houses a very compact electronic transmission chip. When you insert the key inside the ignition slot, this chipset gets activated and generates a radio frequency. The receiver sensor installed near the key hole of your car detects the signal and unlock the car. Now the code of this emitted frequency is distinct for every transponder key and there is no way to unlock the system without the original key. Moreover, this key work with a volatile memory which doesn’t require and permanent energy source to retain information. There is also a version of transponder called the rolling code key that offers additional security. This particular model keeps on changing the unique code which makes it a hack proof. So, what makes this key very secure is that it transmits a unique code that is recognized by the car’s control panel, which then automatically deactivate the immobilizers. If you lose your key and don’t have a spare one, a professional locksmith can still help you. It’s a good idea to get some spare transponder for your vehicles so that you never get into trouble. Usually with the original key with you it will not take more than a few minutes to program the new key. Just remember, using wrong coding or wrong methods can damage your car. So never try to hotwire or force the lock to open. It is best to leave this stuff to professional. At Racine’s Lock and Key, we have years of experience with transponder car keys replacement and know the best and quickest ways to deal with it. If you every get into trouble with a transponder and need a trustworthy locksmith in Mount Pleasant, call us. Our highly trained and fully equipped experts will reach you in no time. We have invested in state-of-the-art software, key cutting machines and tools required to make you a new key and repair the existing one in no time. And if you have lost your key; we will delete it from the system memory so that the previous key no longer works with our car’s system.